Née en 1981. Photographe indépendante, représentée par l’agence Picturetank. Travaille entre la France et l’Afghanistan depuis 2007. Après avoir suivi des études d’art et de photographie à l’Université Paris 8, Sandra Calligaro s’oriente vers le grand reportage et fait un premier voyage en Afghanistan en 2007. Elle s’y installe finalement quelques mois après. Depuis, la photographe alterne reportages et documentaires pour la presse, commandes multimédia pour le compte d’ONG ainsi que collaborations avec diverses institutions artistiques. Au cours des dernières années, son travail d’auteur s’est principalement concentré sur la ville de Kaboul et l’émergence d’une nouvelle classe urbaine. Le projet, Afghan Dream - réalisé avec une bourse du Centre National de Arts Plastiques, a notamment été primé par la Bourse du Talent en 2013. I arrived almost by accident in Kabul, initially for a month. After having studied arts and photography in Paris, I had decided to realize an adolescent dream and to become a reporter, a ‘war correspondent’. A journalist friend had just said ‘go on, Afghanistan is good to start’. His words still resonates in my head; it was eight years ago. During all these years, I have wandered through Afghanistan; I have tried to understand it. I do not know if I have succeeded but I have been deeply touched by the country and the people I have met and now the way I look at it is full of tenderness. Evoking and transcribing all the feelings that come to me about Afghanistan is a hard task but I keep on thinking of this quote of Nan Goldin, an artist photographer that became famous in the 80’s with her daily life and intimate pictures. « For me it is not a detachment to take a picture. It’s a way of touching somebody — it’s a caress ». Finally, I brought back from this great experience hardly any ‘war’ photographs. Rather, it is the fragility of the everyday life of this turbulent country that has always fascinated me. I tried here to show the Afghan uneasiness by highlighting a certain latent distress, underlined by imperceptible details that would come out of these scenes: ordinary situations, moments in-between, where tension is tangible, emotions perceptible, but the conflict rarely visible. Sandra Calligaro (1981 -) is a French free-lance photographer. 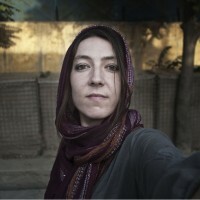 She is represented by Picturetank photo agency and she works between France and Afghanistan since 2007. For the last 8 years, she has been working for French and European media outlets and alongside international NGOs and organizations as well. In her last project “Afghan Dream” the photographer portrays the emergence of the urban class in Kabul, new generation carrying hope for Afghanistan. She got a grant from the French National Center for Arts (CNAP) for this project, which has been shown in France in solo exhibition and several festivals as well.